the pain and emotions of our children. Here are some pointers to help your child — and you — through the first moments of care. Hot or cold for a burn? The traditional approach has been to run cold water over the burned area. However, new research suggests lukewarm water may be best. Cold water reduces the blood supply to the burned area and can lead to an extension of the burn over time. Many plastic surgeons combine approaches, using a minute of cold water to rapidly reduce inflammation and then switching to lukewarm water for the next 5-10 minutes. What about kids who get giant reactions to mosquito bites? These kids are rarely allergic to the insect bite but with sensitive skin, produce a more robust histamine reaction. 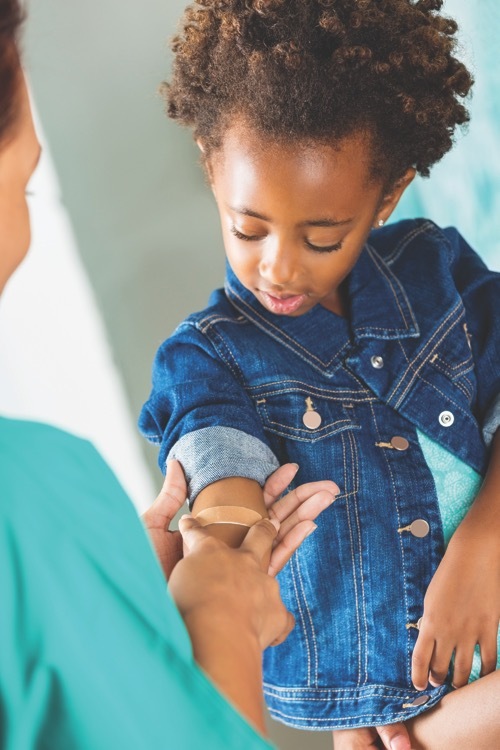 Ask your pediatrician for a steroid cream that is more potent than the hydrocortisone cream available over the counter and rub it on within five minutes of a mosquito bite. Try Caladryl Clear, the calamine is soothing and the clear avoids staining. Poked in the eye – what to do? If there is severe pain upon opening the eye or blurred vision, the child should be seen immediately by a medical professional. If the eye is just swollen or black and blue, apply ice (or a bag of frozen vegetables, which drips less) and give ibuprofen to reduce the swelling. Remember that when you sleep, the swelling pools to one side so don’t be surprised if the eye is swollen shut the following morning. Most bumps need no intervention. The blood supply to the head is more intense than to almost any part of the body and is why an injury causes a large lump. Ice on and off for 30 minutes. If your child is vomiting, lethargic or confused, seek medical attention. Ankle sprains often allow them to still bear weight. If pain is tolerable, rest, ice, compression and elevation, plus ibuprofen. Breaks often have bruising and the inability to bear weight. Tip the head back or not for a nosebleed? Nosebleeds in children are rarely serious and mostly annoying. Pinching two-thirds of the nostril with the head held straight for 5-10 minutes is the preferred method. Tipping the head back allows blood to be swallowed which sometimes causes the child to be nauseated. Meat tenderizer: Papain, the active ingredient in meat tenderizer, works to tenderize meat by breaking down meat protein. Since bee stings contain bee venom, which also is a protein, making a paste of meat tenderizer and water can be very soothing. Hydrogen peroxide: Soak a bandage in peroxide and place it on the stung area and it will keep it clean and reduce the chance of a bacterial infection. Apple cider vinegar: This neutralizes the toxin of a bee sting. Honey: Raw honey contains up to 5,000 enzymes. Glucose oxidase, one of those enzymes, helps produce hydrogen peroxide in the area around the sting and reduces the chances of infection and swelling.